Before Saturday’s HOTWOOD 1000 Series, presented by JM Environmental, Firecracker 100 feature for the Havoline Western Late Models at Stockton’s 99 Speedway, Ron Strmiska Jr. taped a small plastic frog to the roll bar of his trademark #90 pink and black race car for inspiration. Ian, his young nephew who loves frogs, is in the hospital undergoing chemotherapy treatments in his battle against cancer. Strmiska, of Stockton, had qualified only ninth in the 22-car field, but an invert draw of 12 that put him on the second row was just the break he needed. Strmiska took the lead on lap 10 restart after early leader #27, John Moore of Granite Bay retired to the pits with a front end problem. Strmiska stayed out front for the remainder of the event, except for a few laps at mid race when #32, Chowchilla’s Eric Humphries got around him after Strmiska was forced to make some evasive maneuvers to avoid a wreck involving several backmarkers that Strmiska was preparing to lap. Rookie sensation #15, Mark Holeman, age 20 of Los Altos, put in another excellent performance in finishing second, Humphries was third, hometown driver #97, Danny Contesotto had his best race of the season to take fourth and former track champion #21, Dave Byrd of Pacific Grove rounded out the top five. “I am satisfied with second. My brakes started to fade about mid race so we were just hanging on,” said a sweat drenched Holeman afterward. Regular season and HOTWOOD Series points leader #5, Pete Anderson Jr. of Stockton finished in seventh, behind #61, Manteca’s Guy Guibor, after he suffered mid race spin that put him a lap down. Following the race, Ron Strmiska Sr., a former two-times 99 Speedway champion, proudly stood next to his son on the front straightaway as the crowd cheered. For a brief instant it looked as though Wilton’s #18 Jason Fensler would not even take the green flag for the WestCar Series Eagle Fitness 100 feature after he coasted to a stop on the front straight during the pre race warm up. Fensler’s crack crew was able to make the necessary repairs just in time for him to rejoin the 20-car field at the rear for the start of the race. Fensler’s return was bad news for the rest of the field. He carved up the field like a Thanksgiving turkey and amazingly took over the lead from Roseville’s #61, Shannon Mansch on lap 38. Once Fensler was at the front, the drama shifted to the spirited four-car battle ensuing behind him for second. Turlock’s #11, Chris Monez emerged on top of that fight, edging out #50, Gary Glenn of Orangevale, while Mansch settled for fourth and #8, Michael Wendt of Lodi took fifth. Hometown driver Donny Darter led the field in qualifying and then piloted his drove his black #99 to wins in both the dash and the 30-lap main for a career first ever sweep in the American Limited Stock Car division. Darter charged into the lead following a lap 11 restart by diving underneath leaders #5, Richard Harper of Stockton and #6 John Medina of Galt in a daring three car wide pass coming out of turn four that brought the near capacity crowd of 4,516 out of their seats. Harper held Medina off to earn second in the ALSC race, Lodi’s #31 Jeff Ahl came home fourth and #42 Matt Erickson of Ceres completed the top five. Division points leader #75 Chad “the Iceman” Holman of Stockton was plagued by a rear axle problem that relegated him to 11th in the final order. David Ball, #3 of Stockton got around #55 Fred Clements also of Stockton on lap eight and cruised to the victory in the 30 lap Legends main to complete the night’s action. Clements held on for second and #38 Kelly Martin of Modesto rounded out the top three. 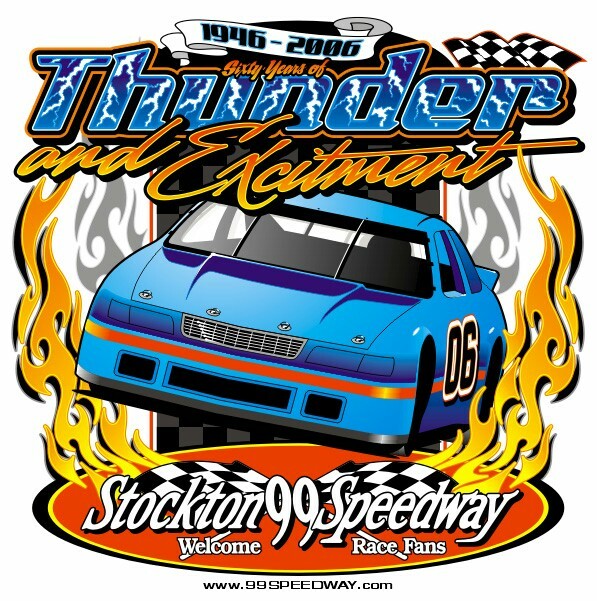 Next Saturday July 8, the 99 Speedway will host a NASCAR Dodge Weekly Racing Series program, presented by Havoline/C.L. Bryant presented by Havoline/C.L. Bryant, featuring the Havoline Western Late Models, American Limited Stocks and Pro 4 Trucks. Co-headlining the card will be the USAC/CASA Sprint Cars in a 50-lap feature and the USAC/BCRA Midgets.